Ah, the family dinner. Picture it: mom and dad sitting down with little Janie and Johnnie to a nice, hot, nutritious meal. Everyone is smiling and happy to be eating such a delicious feast together. Pleasant conversation ensues and all is well with the world. Sounds idyllic, doesn’t it? I’m sure every mom envisions some semblance of that happy family mealtime picture when she has kids. I know I did. It doesn’t take long, however, for that idyllic image to be shattered once you have an actual meal with a toddler for the first time. Not only is the real-life toddler meal experience precisely nothing like that pretty little description, it is likely to be more similar to a seventh circle of hell. Sounds fun, right? All joking aside, mealtime with toddlers can be challenging, to say the least. Refusal to eat a certain food, or anything at all, playing with food, throwing food, crying when the food is the wrong color, texture, smell, taste, etc., running around the table, exercising rude sounds…you name it, your toddler probably has done it at dinner time. But it doesn’t have to be this way! Fortunately, there are some simple, but effective, steps you can take (the sooner the better!) to encourage a more peaceful and enjoyable toddler mealtime experience. Kids thrive on rules and routine. Setting down some firm mealtime rules, and establishing and sticking to a dinner routine early on, will make a huge impact on how your toddler acts at the table. Rules such as no playing at the table, no eating anywhere but at the table, and no getting up from the table until you’re finished made some good, solid guidelines for a peaceful meal. Granted, these rules can be hard to enforce, but it’s important to stay firm. I can’t tell you how many times I’ve sent my son to bed with a half-full belly because he refused to stay at the table. He learned after about three or four unfinished dinners that mommy was serious. He now sits and finishes his meal before he’s excused from the table and he’s only two. As for a routine, having your meal prepared and ready to eat around the same time every evening is key. I know some nights a later dinner can’t be helped, but if you’re keeping dinner time to about the same time every night, it will help keep your kids behavior in check. When they know what to expect, when to expect it, and about how long it will last, they’re more likely to be able to keep their crazies in check for that time. From the moment our daughter was old enough to eat with us at our dinner table, my husband and I had to have a “come to Jesus” moment about our eating habits. We knew that if we wanted our kids to eat good, healthy food, and try a variety of it, we needed to lead by example. That meant my husband would have to eat more than lettuce and carrots as his only source of vegetables and we would both have to curb our enthusiasm for ice cream on a regular basis. If we wanted to teach our kids good eating habits, we had to model them. We also knew this same concept was true for table manners. While neither my husband nor I had bad manners, we knew we’d probably need to start self-enforcing some key behaviors, such as staying seated until everyone was finished with the meal. If you want your kids to exhibit good manners at the dinner table, brush up on some etiquette and start practicing as early as possible. Teach your children from an early age to choose healthy options by offering them a variety of good, wholesome food from the beginning. Try to offer a variety of shapes, tastes, colors, and textures with the food you prepare for them and be sure to prepare the food in bite sized pieces so that little fingers can easily grab them. 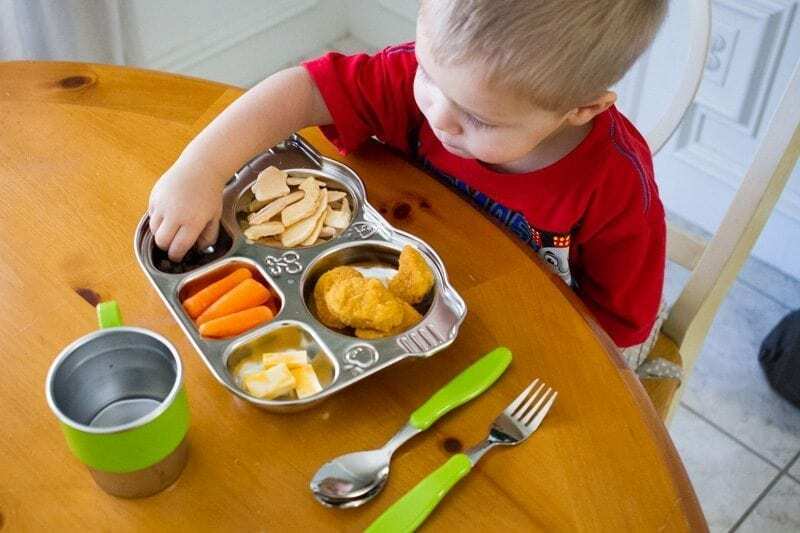 One way to offer a variety of healthy, bite-sized bits for your toddler is to use specially divided plates, like the Din-Din Smart Bus Platters by Innobaby. 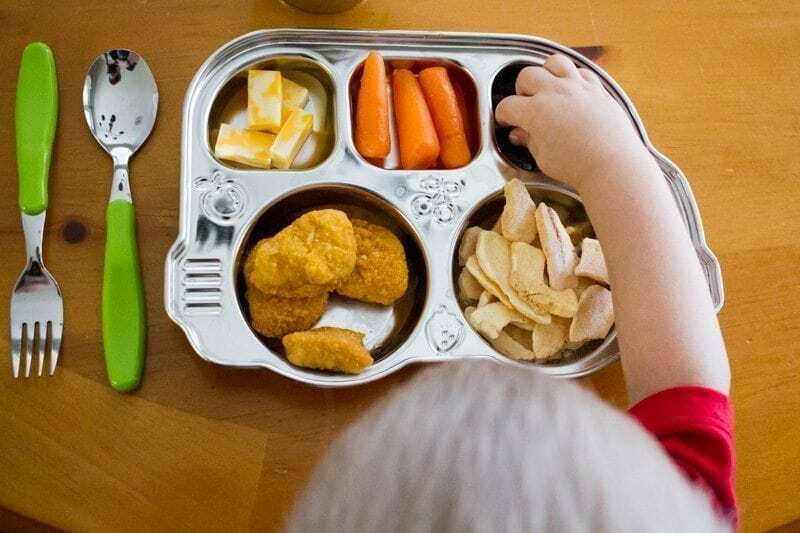 These awesome stainless steel platters offer five separate compartments that are perfect for introducing your little one to several different foods. This plate is also great for picky eaters who don’t want their food to mix or touch. 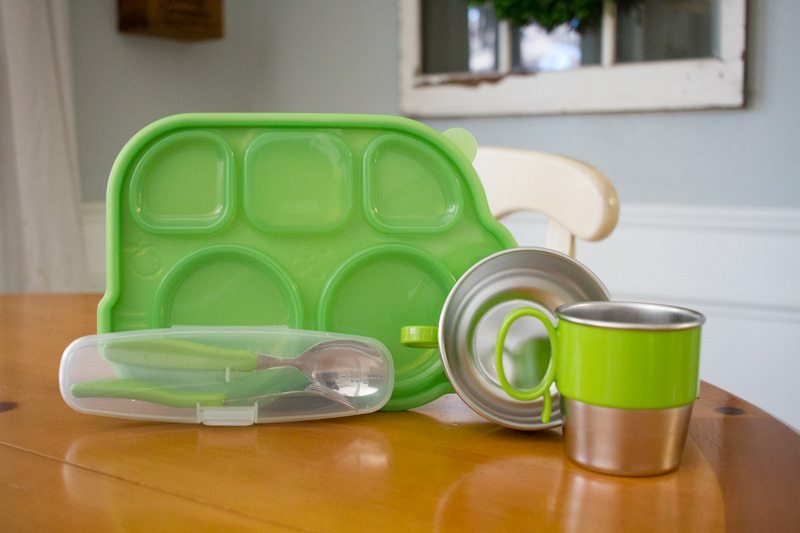 It even comes with a sectional lid so that you can save any food your tot didn’t finish. It may seem tedious, but praising your child for even the smallest of good behaviors during a meal will make a huge difference in their overall mealtime behavior. When they try a new food, even if they spit it out, give them praise for having the courage to try something new. When they use a fork correctly for the first time, make a big deal of their accomplishment. I know a lot of moms have a hard time keeping their kids seated at the dinner table through a meal. If your son has a problem sitting still for 10 minutes straight, encourage him to sit still and eat for two minutes. When he accomplishes that, praise him highly and then don’t make a big deal if he runs around the table for the rest of the meal. Start small and work your way to longer periods of time. When you make a practice of praising the small accomplishments, your child will inherently want to do more to earn your accolades. Little by little, dinner time will get easier when you make it an opportunity for your kids to earn your praise. As soon as they are able, let your kids start helping you out in the kitchen, even if it’s in a small way. Buy a small stool and keep it within reach so that your tot can climb up and either help or watch you prepare the meals. My daughter loves to help mix and stir and my son simply loves to watch the action. It’s a great way to help them understand all the work that goes into making a meal and you also get to teach them about all the different ingredients and the process of making a meal. After dinner, enlist your toddler to help you clean up and put things away. 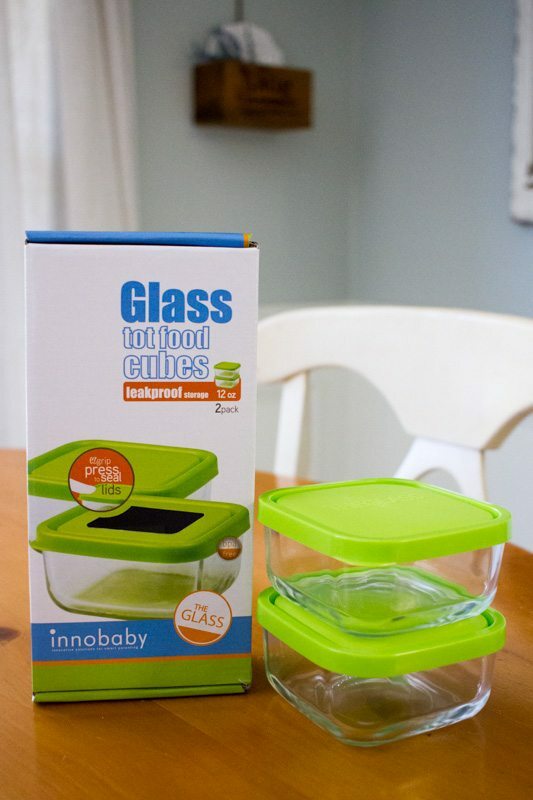 I love to get my daughter to help me put any extra food into our favorite Innobaby Keepin’ Smart Glass Tot Food Cubes. We switched from plastic storage containers to all glass containers several years ago and we love them! These glass food cubes are durable and versatile and my daughter loves to help me put the lids on and carry the cubes to the fridge. It makes after dinner clean up a breeze when you let your little ones help in any way they can! This should really go without saying, but electronics should not be a guest at your dinner table. Turn off the T.V., silence your phone, put away the tablets, and for 30 minutes focus on your family without the distraction of the digital world. You will be amazed at how much you will learn about your family members and how much you will be able to connect on a deeper level simply by having a conversation at dinner. Engage your children, no matter how young, to practice meaningful dinner conversation by asking them to tell you about the favorite part of their day or what story they’re looking forward to reading at bedtime. The earlier you start this practice, the easier it will be to encourage open dialogue with your kids when they’re pre-teens and teenagers. Practicing these 6 steps will work wonders in moving your family meal times from a chaotic and frustrating experience to a more enjoyable time that you will actually look forward to. Start using these tips early, be consistent, and be firm in your rules and routines. And don’t forget to practice patience and grace; after all, toddlers are wired to push their boundaries and test your limits! Keep working with your tots on their manners, praising their accomplishments and engaging them before, during and after mealtimes and soon you will see a big difference in their behavior.